This is the best product I have ever bought, hands down! I'm not even over reacting! It's the best eyeliner I've ever used! It stays on as long as you want it to, and I'm not exaggerating. I stayed over at a friends house and forgot to take my makeup off, but when I woke up the eyeliner was still perfect and it looked exactly the same as it did 24 hours ago when I first applied it. 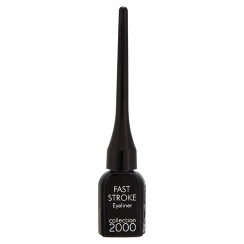 With this eyeliner there is no need to re-apply or put any sort of extra coat on. You just apply it like you would any normal liquid liner. The brush is also really easy to use and it is quite thin so you can get to places that you may normally have to leave pale because your brush can't get to it. It's also really cheap as well at a price of 2.99! You can't go wrong! I will never change eyeliners, there is literally no flaw about it!